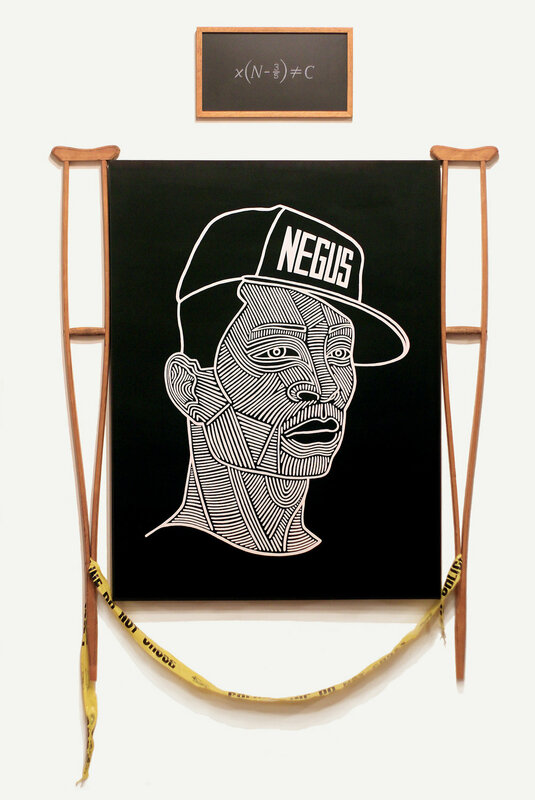 Gray uses discarded materials, including crutches, police barrier tape and imagery found on the internet, to create a coded visual language. In his artistic practice, he loves to examine, dissect and arrange multiple sources of information into his work. He samples symbols of Western culture like a hip hop producer and remixes the content into a new narrative. Using a variety of disciplines, including painting, mixed media, assemblage, drawing and installation, he reassembles them in a manner that becomes more than the sum of its parts. Language is frequently applied to the surface as a point of entry, to examine how words are used as representations and declarations of power to define parameters in social hierarchies. Gray envisions art as a transformative tool to advance our understanding of each other, the world around us, and the cultural necessity to advance humanity in the right direction that benefits us all. His recipe of historical and contemporary references, are continually stirred in his hearty pot of eye gumbo: a visual meal for the mind, thickened with a roux of black culture, marinated in social commentary and seasoned with consciousness. Gray has exhibited work at Prizm Art Fair 2017, the Orlando Museum of Art, Duke Performances’ “Monk @100: A Century of Genius” in Durham, Nasher Museum of Art at Duke University, SCOPE Miami 2012, and the United Nations Headquarters in New York City. His work is in the permanent collection of the North Carolina Museum of Art.